IF YOU ARE BORN ON FEBRUARY 3, you are extremely active my dear Aquarius… sometimes, too active. Famous people born on February 3 may need to slow down just long enough to enjoy the fruits of their labor. All work and no play can be stressful. It could be the reason they tend to have emotional outburst at times. It has been suggested that they are not the most sympathetic people in the world. Nonetheless, they are a loyal and supportive friend and family member. When it comes to love and romance, famous people born on February 3 could learn to be a little more expressive. Instead of talking about their feelings, they love to shower their partner with gifts. They can’t buy love though. 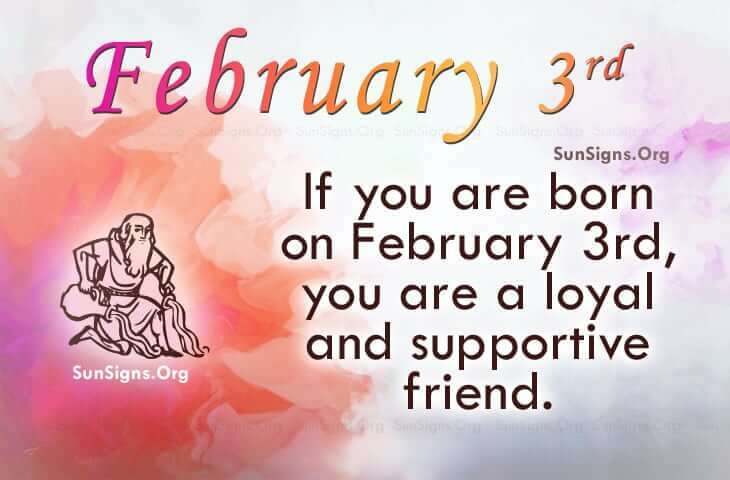 If you share this February 3 famous birthday, you are probably afraid as you feel that you will compromise your freedom or your financial stability if you let someone get close to you. However, if you continue to think this way, you may be alone for a long time. Come on… give love a try. If your birth is on the famous birthday of February 3rd, you can be a focused, down to earth, hard working Aquarian. Alternatively, they are likely to have a volatile famous birthday personality but devoted to loved ones. They want to settle down but don’t want to risk their freedom or power. When they decide on something, they put their all into it.